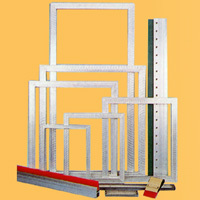 The Pneumatic Mesh Stretcher is the latest model developed and produced by us. It is characterized not only for its ingenious, practical and elegant appearance, but also for its firm structure, light weight, durability and reliability and has therefore become an un-substituting product in the screen printing industry. Mesh Stretching Machine^$P-MS series mesh-stretchers are mainly composed by the following five parts; frame, mesh pole moving structure, chain driving, structure, net collets and the pneumatic system. Each part has its special features; the frame is light and firm; the silk pole moving structure is accurate and has outstanding self-lock function; the chain driving structure is light and reasonably distributed; the net collets are composed with reliable and firm double rocker which is patented by us only. Strong clamping force is the main reason to decide the quality of net stretching and our product is right beyond all other products at this point.